People who love to eat often tuck into their food with gusto. If you enjoy dining, you might do the same. However, unless you're endowed with a slim figure, you will benefit from watching how fast you eat. 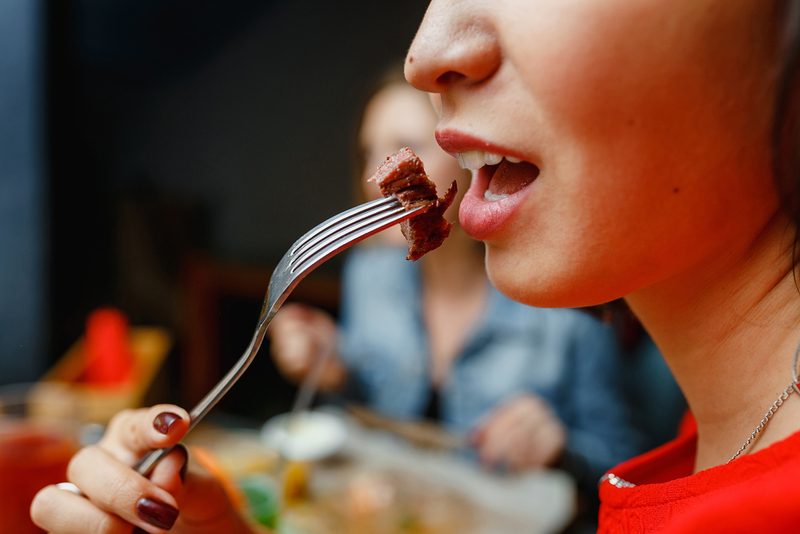 A recent study shows devouring your meals with too much enthusiasm will cause your waistline to increase and detract from your health. Researchers discovered people who eat properly consume fewer calories than those who eat fast. When you savor food, instead of wolfing it, your mind registers how much you're ingesting. As your stomach swells, a signal informs your system when to quit eating. It takes twenty minutes for the process to work, and if you're not eating in a slow manner as nature intended, you might overfill your belly before the procedure begins. Don't eat so fast, and food will satiate your hunger so you don't overeat. Do you think about chewing when you eat? Most people practice mindless eating because they are conversing while dining or have other things on their minds. Be attentive as you eat, though, and you'll remember the need to ingest foods at a leisurely pace and chew them thoroughly. Slowly eating aids nutrient absorption, regulates the appetite, and helps you enjoy mealtimes. You'll recognize when you chew, rather than consume fare inadequately because the food in your mouth will liquefy or lose its texture. Until, now, you might not have been acquainted with the concept of not swallowing solid mouthfuls of fare, so doing so may feel odd. With practice, you'll get used to chewing foods so they aren't dense though. Whether you want to lose weight or absorb the nutrients in the foods you eat, it's best to stop demolishing meals and savor them instead. As a result, you will get greater pleasure from meals, and have a smaller waistline and improved health.